What is the hypotenuse formula? Pythagorean theorem calculator will calculate the length of a missing leg or hypotenuse of a right triangle. The hypotenuse of the right triangle is the side opposite the right angle. This side can be found using the hypotenuse formula, which is another term for the Pythagorean theorem when we are solving for the hypotenuse. Recall that a right triangle is a triangle with an angle measuring 90 degrees. The other two angles must also total 90 degrees, as the sum of the measures of the angles of any triangle is 180. What is the Pythagorean theorem and how is it used? The theorem was credited to the ancient Greek philosopher and mathematician Pythagoras, who lived in the sixth century BC. Although it was previously used by the Indians and Babylonians, Pythagoras or his students were credited to be the first to prove the theorem. It must be noted that there is no concrete evidence that Pythagoras himself worked on or proved this theorem. Input the lengths of the legs or hypotenuse in the formula. For example, suppose you know a = 4, b = 8 and we want to find the length of the hypotenuse c.
Take the square root of both sides of the equation to get c = 8.94. Go ahead and check it with our Pythagorean theorem calculator! The Pythagorean theorem calculator will solve for the sides in the same manner that I displayed above. It's just a way to show you how you can solve if you prefer to do it by hand. The hypotenuse formula is simply taking the Pythagorean theorem and solving for the hypotenuse, c. Solving for the hypotenuse, we simply take the square root of both sides of the equation a² + b² = c²and solve for c. When doing so, we get c = √(a² + b²). This is just an extension of the Pythagorean theorem and often is not associated with the name hypotenuse formula. So if the coordinates are (3,6) and (7,10), the slope of the segment is (10-6)/(7-3) = 1. If the slope of the other segment forming the angle is -1 then the lines would be perpendicular since 1 * -1 = -1. Therefore, the triangle is a right triangle. You can also figure out the missing side lengths and angles of a right triangle using the right triangle calculator. If the angles are given in the problem in degrees and you want to convert to radians or radians to degrees, check out the angle conversion. There is an easy way to convert degrees to radians and radians to degrees. Sometimes you may encounter a problem where two or all three side lengths missing. In such cases, the Pythagorean theorem calculator won't help - you will use trigonometric functions to solve for these missing pieces. This can be accomplished by hand or by using a triangle calculator. 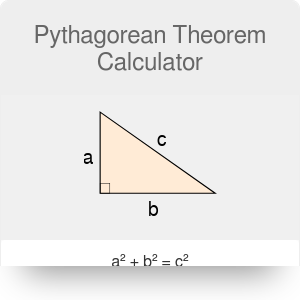 Pythagorean Theorem Calculator can be embedded on your website to enrich the content you wrote and make it easier for your visitors to understand your message.